Today was another errand day, as I had to renew my driver’s license. Always fun to make a trip to the DMV! There’s probably nothing that could be a greater reality check than the lines, employees and procedures at the DMV. I made an appointment at the one in North Park, as the others had a longer wait and I wouldn’t be able to get an appointment until the end of the month/after my deadline. So off to North Park I went. Surprisingly, the DMV was as smooth as pie. I was in and out of there in, I kid you not, twenty minutes. I even got to take a new photo, thank goodness. I decided to leave my weight at 120 lbs… incentive. Since I was already in North Park, I thought I would check out a coffee house I had read about. Claire de Lune is on University Avenue, right near the North Park sign. Great coffee, good food and a nice, open floor plan with lots of seating arrangements to choose from. Only negative is that some of the furniture is a bit old, and therefore, a bit dingy. After a couple hours at the coffee house, I drove on University headed West. I really had no idea where the street went, and so decided to do some exploring. University turns into Washington and ends up dumping you downtown near the railroad tracks. I drove further and ended up down near the Midway Pier, remembering that there was a regatta in town for the weekend. I figured they’d be on the water practicing. Well, was I treated to some up-close views of really cool sailboats! I stood at the end of the pier and having just arrived just in time for a race. It was so awesome to see these racing boats whiz by right in front of the pier as they got in position for the start of the race. Since it was the middle of the day on Thursday, there were very few fans on the pier, which made it really easy to take pictures and get more information on the boats in the race. One sailing and photo fanatic gave me the scoop. You know, today I set out to renew my driver’s license, but with an adventurous spirit and the will to go just a bit further, I ended up having a really great day and got to enjoy a unique San Diego event! Made me love my hometown even more. And renewed my excitement to uncover more treasures of the city. 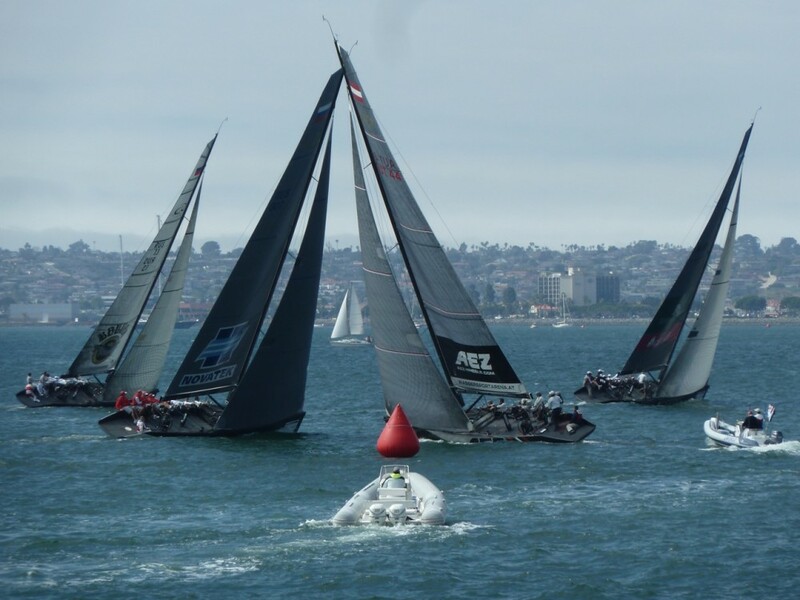 The Highly Competitive RC 44 Championship Tour Will Visit California For The First Time. The biggest names in the sport of sailing, including Russell Coutts, Paul Cayard, James Spithill, Rod Davis and Terry Hutchinson are coming to race against each other on San Diego Bay from March 2-6, 2011 in identical 44-foot sailboats, the RC 44.